We choose the leading brands for the great guarantees which they offer. Find out more about their fantastic guarantees. All our block pavers are fully trained and have years of experience in block paving driveways. We use the best materials available for our customers driveways. To ensure that your driveway will take the weight of the modern 4 x 4 or people carrier. The modern block paved driveways, have to have the correct sized block setts and base to ensure it is suitable for todays vehicles. The services extend to full landscaping, artificial grass and brickwork. So you can rest assured with The Driveway Company. 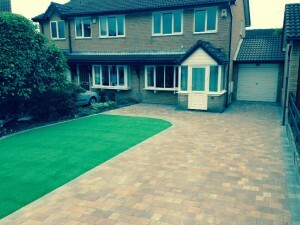 We can take care of not just your block paving driveway, but your whole project. They are lots of different styles of block paving, on the market today for driveways. Such as different constraints, shapes of blocks and designs. We can go through the choices on the market with you, helping advise you on the right type of block paving for your project. Why not pop along and view our displays. We have a showroom based at Clays Garden Centre, Peel Retail Park, Washington, Tyne & Wear. You will be able to see some of the choices available to you, as well as our work. We have lots of testimonials from satisfied customers. If you would like to spak to some of our customers that have had work carried out with The Driveway Company. Let us know and we will do our best to arrange this for you. Call us today for a free quotation for your block paved driveway.